BlogHome » Mike has written a children’s book… Well sometimes when you get an itch you just have to scratch it! Mike has written a children’s book… Well sometimes when you get an itch you just have to scratch it! Norfolk like so much of Britain is full of little villages just like ours, there must be thousands of them. One of the endearing things about many of these villages is their quaint or weird names such as the lovely village of Sheepy Magna (where I notice that All Saints Church held a Sheepy Church Fete). There’s the inexplicable Barton in the Beans, Kingsbury Episcopi (which sounds more like a small medical procedure) and of course Wetwang which we’ll say no more about! This is me back in the early 70’s when hair was long and collars the size of seagull wings. When I lived near Royal Leamington Spa my friends said we were going to visit Fenny Compton. We had sat for half an hour in The Wharf Inn before I realised it was the name of the village! There’s Tiddleywink and even a Thrumpton (Surely the origin of Trumpton it even has Thrumpton Hall) . As for Puddletown it has the Piddle flowing through it and the Piddle brewery do sell their ‘Piddle in a bottle’ and on draught in, wait for it…. The Piddle Inn. This brings me nicely to one of my favourite and most local villages, Little Snoring. My juvenile mentality kicked in and I started envisaging the many scenarios this offered. For instance there must be a Little Snoring teacher in a classroom full of Little Snoring children. Sunday would be so quiet in church as the Little Snoring congregation sit there. In my minds eye I see a blissful ‘Brigadoon like’ village where everyone is nice because they all get a jolly good sleep unlike that noisy Great Snoring village just down the road which wakes the whole of Norfolk. 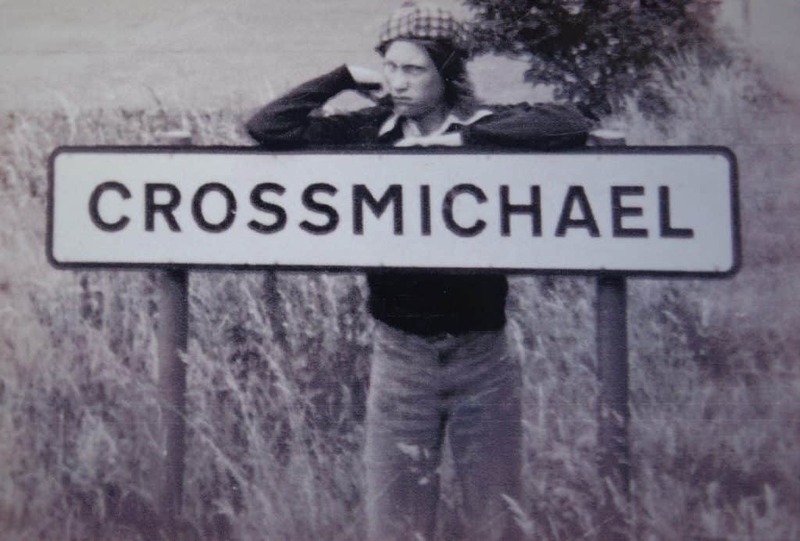 Then it just took over my mind set and every time I drove through the village I came up with another character. There is even a Little Snoring airport where planes rarely land or take off, it is just so laid back, so… Norfolk. Thus an itch began to niggle and I expressed said itch to my daughter who encouraged me to write down these stupid thoughts. As I did so they very much reminded me of those fantastic days when my Grandmother used to tell me proper bedtime stories. She would tell them with such belief that those stories came alive and yet by the end of each story I had either dropped off or was starting to. 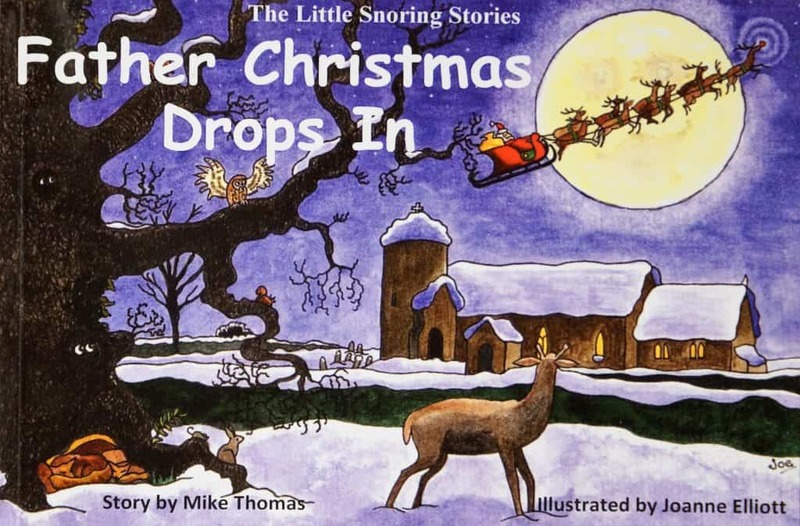 The net result is a collection of 7 Little Snoring Bedtime stories which I’ve tried to write in a traditional style, purposely written to help calm down bouncy and excitable boys & girls for bedtime. Now a children’s story book is a lost cause without supporting illustrations and for this I had an ace up my sleeve. Several years ago we had a guest stay who did a lovely cartoon of me serving their breakfast. Like all cartoons it pulled on many truths and hit the spot beautifully. The lady’s name is Joanne Elliott and I then saw all of her wonderful work including stunning pet portraits and a vast assortment of other skills including ink. Knowing that she had illustrated previously I sent her the stories and bless her she actually agreed to do some illustrations for one of them. Jo’s colourful & witty illustrations are absolutely brilliant and totally bring the story alive and I’d like to thank her very much for enabling me to scratch that itch. So here it is, Father Christmas Drops In, my first and probably last foray into the world of self publishing. Both Jo & I are really proud of the finished product and I would like to thank everyone that helped and encouraged me. Especially for those that helped me correct those truly dyslexic errors, my son, my wife and of course my spellcheck! Oh and Claire for prodding me into action. The Story is set on a very cold Christmas Eve when all was quiet in the sleepy Norfolk village of Little Snoring. However, Santa’s arrival causes quite a stir when he accidentally drops into the village with a thud. 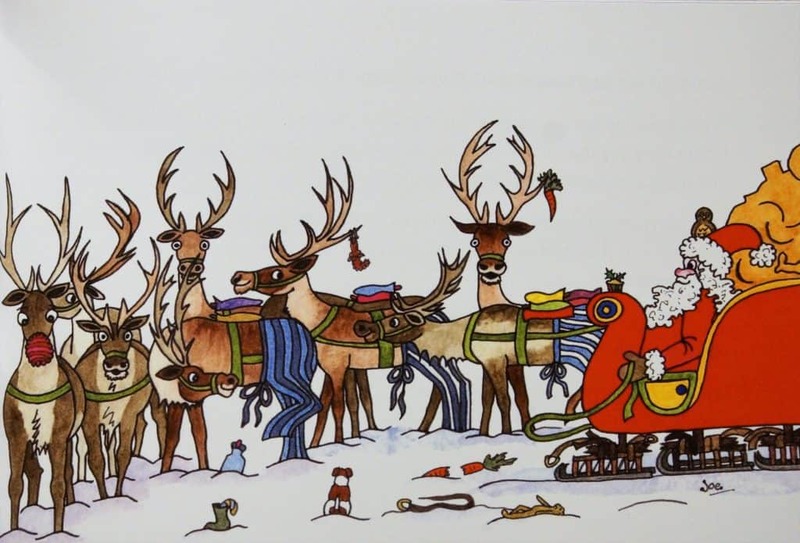 Stranded with a damaged sleigh and grumpy reindeer it takes the brains of little Claire Nap and the collective skills of all the children in the village to get Santa back delivering presents again. Every story starts with the same introduction also ending in a similar way…. Not too far away down the road, up over the hill and just around the bend where the little stream meets the fields of golden corn there is a very small sleepy village called Little Snoring. It is a very happy village where all through the day everyone enjoys their work and their play. Then when the day is done and everyone is oh-so-tired they all tuck themselves into bed and sink into a beautiful dreamy sleep. After a while, if you listen very carefully, you will hear a gentle snoring sound as soft as a cat’s purr, and as comforting as warm pyjamas. This, my friends, is the sound of Little Snoring village fast asleep. This is to re-enforce the ‘it’s time to go to sleep now’ message. Be careful this book may cause drowsiness and you should not drive or operate heavy machinery after reading it!! I have had a limited amount of these books printed and are selling them at just £6.00 each (just the price of 2 Starbucks Caffee Mochas but the book will last a lot longer!). They are professionally printed on quality gloss paper as a paperback. I can post them to most places in Britain for £7.50 including book & packaging (multiple orders priced individually). I can also sign and personalise the books if you wish! So if you are looking for a small Christmas present for children either approaching or between the ages of 5 ~ 7 then please email me at mike@theoldbakerynorfolk.co.uk with your name, full address, phone number, how many books you want and I will send you instructions on how you can pay.